I am an amateur so sorry for any misunderstanding. I am trying to find a deep-sky object located 1° north east from the δ Cas star. 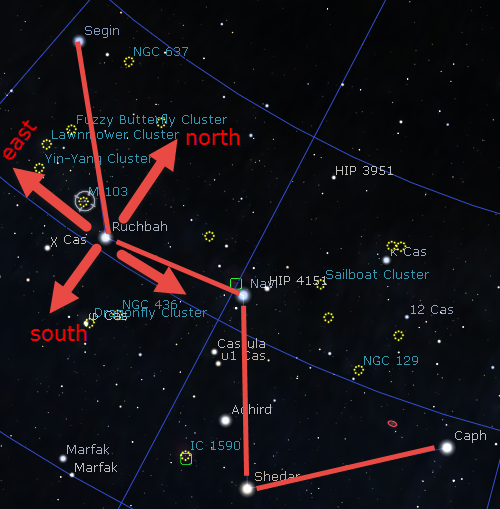 I am using the Stellarium program to do this. I have toggled on the equatorial grid and Cardinal points are displayed as well, however, all of the cardinal points appear to be on circumference and I cannot really tell which direction is the wanted object at. Usually when the direction to an object is given relative to a star, the directions are related to equatorial coordinates (the coordinates on the sky). They are not related to the compass or cardinal points. It is best to avoid directions relative to the horizon/compass/cardinal points since those depend on the time and location. north is toward Polaris along a line of right ascension, so you would go in the direction of increasing declination from $\delta$ Cas in the direction of Polaris. east is along a line of declination in the direction of increasing right ascension. Here is a view of Cassiopeia for an arbitrary time and date with the directions shown. Are you trying to locate M103? In the sky, north is the direction toward the north celestial pole, and east is 90 degrees counterclockwise of that. On the equatorial grid, declination increases northward, and right ascension increases eastward. If $\delta$ Cas is at J2000 1h26m +60.2$^\circ$, then 1 degree northeast of that would be about 1h32m +60.9$^\circ$. Terrestrial directions only help you find objects near the horizon, e.g. "look for Mercury 10 degrees above the eastern horizon half an hour before sunrise." For objects near the celestial pole, depending on the month and hour, north could be up, left, down, or right. If you ask Stellarium to show deep-sky objects via the spiral galaxy icon in the lower toolbar, it should show a dotted circle symbol where M103 is. Not the answer you're looking for? Browse other questions tagged deep-sky-observing navigation or ask your own question.